As with all wedding weekends, the goal is to end with... well, a wedding! And this one was the prettiest I've attended to date. There's that saying that goes "the devil is in the details." Well let me tell you, he must have been all over the place, because not one detail was left unconsidered. From the venue to the flowers to the food, it was the most perfectly Southwestern wedding. The wedding took place at the historic Los Poblanos Inn & Organic Farm in Albuquerque, whose primary agricultural source is lavender. As a result, the fragrant smell of lavender followed guests from the outdoor ceremony site to the seated dinner, and beyond. The outdoor ceremony took place at 4:30pm in the middle of the property's rose garden. The seated dinner consisted of spectacular field-to-fork dishes prepared by the kitchen staff. Most of the ingredients from the meal were grown on-site. Taking a page from a book on marriage. And you simply can't do the Southwest without some sort of turquoise. A carved wood detailing on one of the many hand-crafted antique doors on the property. Me, 15 weeks pregnant, and my handsome man in his handsome suit. As I bridesmaid, I had the pleasure of wearing white. And for Adam, I knew I wanted him to wear a bowtie, but I had a difficult time narrowing down which one because I was in love with them all. So, I tried a new strategy: I started with the pocket square (I chose this one from Kathrine's collection of vintage finds) and went from there. One of the great things about pocket squares is that, if you can find one with a variety of colors in it like I did, the options of mixing it with different ties and bowties are endless. I then chose the Coral & Grey self-tying necktie because it paired nicely with both the salmon and green colors in the pocket square, as well as Adam's midnight blue suit. 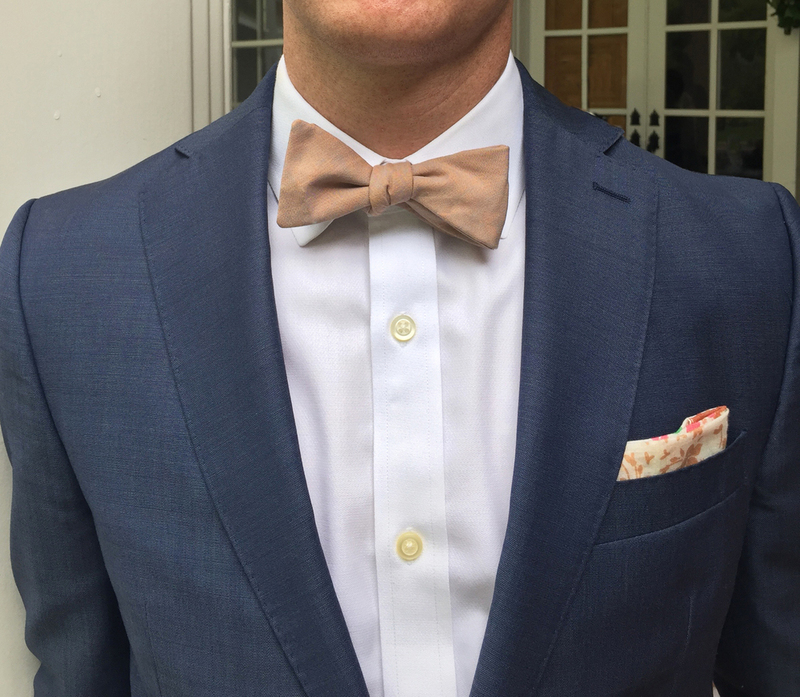 His cognac-color leather oxfords completed the outfit, and played nicely off the colors in the bowtie and pocket square. Now look at this guy. Don't tell me he doesn't look sharp! Feeling inspired to recreate his outfit? You can get details from his look below!